If you’ve been following our blog, or had a chance to check out our videos you may have lots of ideas for keeping your office move on track. Yet, many organizations struggle on moving day because they don’t create a plan to get everything done. 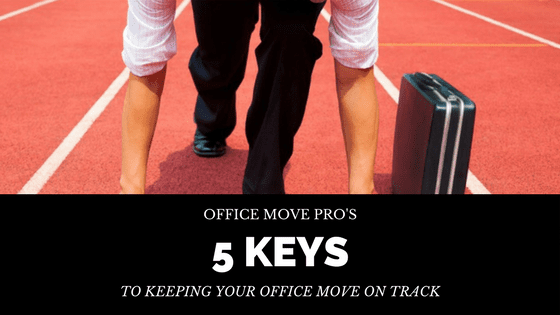 We’ll show you the five keys to keeping your office move on track with the help of an office relocation strategy. A relocation strategy provides an overview of your plans and what exactly needs to get done before, and on, moving day. To keep your move on track you’ll need everyone on board. Address any concerns upfront so you can move past them and put a plan in place that everyone understands. You can do this by interviewing employees, brainstorming and meeting. Decide who will be responsible for each department, liaising with your office movers, and preparing and distributing internal and external communications.Then keep everyone informed as your move progresses, so you can identify potential issues as they arise. Think about how your actions will impact the entire organization so nothing is overlooked. You should anticipate the critical times for your business – new launches, major events and peak season – to avoid undue stress and conflict. If you can’t avoid moving during a critical time, it’s better to plan as early as possible. If you’re planning a major multiphase move or renovation, you’ll need support. A professional move coordinator will keep your project on track. Maybe your staff is be capable of packing boxes, but not moving them – even with the convenience of E-Crate moving bins. You should also develop a plan for office items that require special treatment, like: IT equipment, artwork and excess furnishings. You’ll need special equipment and services like storage, transportation, or packing materials to manage these items. The right tools make it easier for you to prepare your office for relocation. They also keep your valuables safe and secure. Plan for these gaps early on so that you don’t risk deadlines. Professional movers will assess your office and its contents ahead of time to make sure they supply you with the right equipment for moving day. Just like any other company project, your relocation project needs a strategic plan to stay on track. You can’t expect to reach your goals effectively without one. A documented plan takes the guesswork out of moving assignments and ensures all protocols are followed, which saves time all around. An office relocation strategy provides an overview of all aspects of your move that can anyone can refer to. Additional documents focus on tasks and procedures like properly preparing for your office move, and project details like drawings of your office design. We can help keep your office move on the right track from start to finish. Watch this short video to see how. Then give us a call. Get in touch today. We love it when a plan comes together.